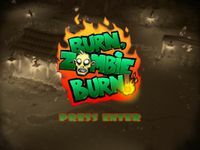 "Burn Zombie Burn", developed by the Kuju owned Double-Six studio, appears to be a simple top-down twin-stick shooter with a zombie theme, however it's a little deeper than first appearances make it look. Indeed, players do shoot up waves of zombies, however to achieve high scores, it's more about management of zombies by setting them on fire & using them to create combo chains. "Burn Zombie Burn" is notable for being the first release partly funded by Sony's "Pub Fund" where they guarantee to match any funds put forward by the developer in royalties.